To get the best out of your system, you’ll need a car amplifier wiring kit so you can hook up the powerplant to the stereo. Today, we’ll look at 5 of the very best car amplifier wiring kits then walk you through what you need to look out for when you’re buying one. What Type of Wiring Kit Do You Need? How About The Wire Size? Have You Got Multiple Amps? Kicker is a household name in the car audio field and this 4-gauge power kit is tailor made for all systems up to 1000 watts. You’ll get everything you need including a decent selection of hardware to make installation a breeze. There’s a 1-year warranty in place. If you buy this kit with a Kicker amp, you’ll get that guarantee extended by a year into the bargain. If you’ve got a beefy sound system and you’re looking for a premium-grade 4-gauge installation kit, the Kicker PK4 is an obvious choice. While this kit is suitable for class D amps up to 1000 watts RMS, take note that the maximum output it serves for class A/B amps is 650 watts RMS. The oxygen-free copper wiring is used to enable maximum power and optimal signal transfer without the menace of resistance and distortion. You’ll get 17 feet of power cable and 17 feet of lead wire. On the Amazon listing this is incorrectly claimed to be 20 feet so buyer beware. You’ll also get the wiring kit, 2 feet of ground cable, a fuse holder and fuse along with a range of hardware to make your life easier. The NVX 4-gauge is a sterling installation kit coming in at a very attractive price point. This kit is available for 2-channel, 4-channel or 5/6-channel amps so you’re spoiled for choice. You’ll get everything you need for a quick, clean install in one package so you can get straight down to business. Components are rock-solid and you’ll get first-class performance at a third-class price tag for the double win. If you’ve invested heavily in your sound system, the last thing you want is to let yourself down by getting a shoddy wiring kit. While this NVX 4-gauge is not particularly expensive, you certainly won’t be stiffed in terms of performance. You’ll get literally everything you need with this kit to wire up any amps up to 1000 watts RMS. Wire is top-notch silver-tinned copper that will hold up to even harsh conditions without letting you down. You’ll get 20 feet of power wire, 20 feet of remote lead wire, 40 feet of speaker wire and 3 feet of main ground wire. This is more than generous on the length front and is one of this kit’s key selling points. Heavy duty distribution blocks and fuse holders along with all the terminals, connectors, fuses and zip ties you need completes a great value package of wiring built to last while delivering top-tier performance. Few collections of the best car audio kit come without an entry from the stellar Rockford Fosgate. This 4-gauge kit is also available in 8-gauge and, while it might not be the cheapest option at your disposal, it’s a strong kit from a brand you can trust. You’ll get the hardware you need along with most components to wire up your amp for outstanding sound quality. While this kit doesn’t give you absolutely everything you need to install your amp, you’ll get a great range of wires and components covering most main bases. Length of wiring is more than sufficient for most needs. You’ll get 17 feet of power cable, 3 feet of main ground wire, 20 feet of RCA and 20 feet of remote wire. Power transfer is optimized thanks to oxygen-free copper and the caliber of the power and ground wire. This kit is expressly designed for powerful systems and is good up to 1200 watts. You’ll get a fuse, connectors, a grommet and some cable ties thrown in for a comprehensive package that will see you on your way to a rocking sound system. Boss Audio continues to dominate the car audio space with superb products at very competitive prices. 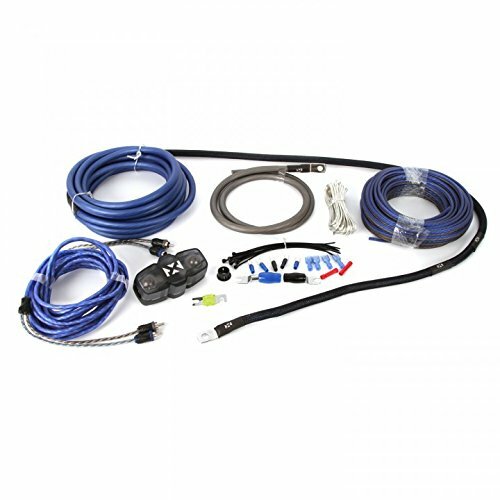 For a wiring kit, the KIT2 represents outstanding value without compromising quality. As well as the basics, you’ll also get plenty of extras so this kit is perfect even if you want to hook up multiple amplifiers in a more complex sound system. You’ll get a generous helping of wire with this kit so you can connect several amplifiers if need be. You’ll get 20 feet of 8-gauge power cable, 3 feet of ground cable and 18 feet of turn-on wiring. For multiple amp set-ups, there’s also 6 feet of loom tubing, rubber grommets and wire ties so you’ve got all you need at hand. Insulation with this wiring is first-rate. This will extend the lifespan of your wiring while also protecting against corrosion, an exceptional bonus at this price point. With ring terminals completely this highly attractive wiring kit, you can count on Boss Audio for quality at a bargain basement price. We can’t recommend the KIT2 strongly enough. 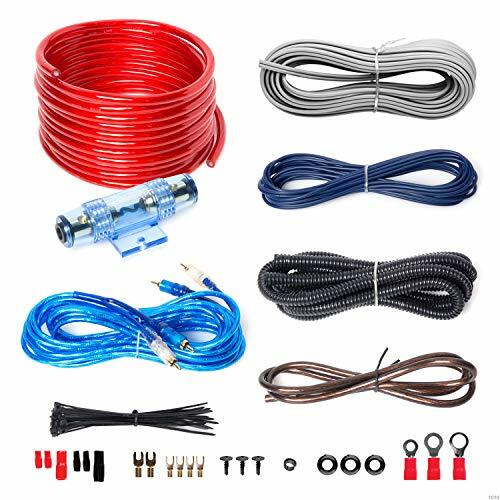 For an all-in-one 8-gauge wiring kit that combines performance and affordability in one enticing bundle, the KnuKonceptz package deserves a place on any shortlist. The wiring is extremely easy to work with and you’ll get ample length for most reasonable installations. The copper aluminum cables are an uprated version of copper-clad aluminum. Last but by no means least in our best car amplifier wiring kits reviews is an outstanding package from KnuKonceptz suitable for pretty potent sound systems that doesn’t cost you a fortune. You’ll get 18 feet of power wire, 3 feet of ground wire and 20 feet of speaker wire so you won’t be cursing or fiddling around with lengths too short for comfort. The copper aluminum used is a notch up from copper-clad aluminum and forms a fantastic delivery system. There’s also a fuse holder, RCA cable, gold-plated ring terminals, grommets, loom and wire ties so you have everything you need to hook up even ambitious systems. Now you’ve got 5 great amp wiring kits for some inspiration, we’ll run down a few of the things you need to take into account when you’re buying one. Choosing a car amp can be confusing enough. Do you need a monoblock or a 2-channel? Perhaps you have more speakers and you want the versatility of a 4-channel or 5-channel amp instead? Check out our series of guides and reviews to help you make the right decision here. Once your amp is in place, you’ll need the proper equipment to hook it up and that starts with the best wiring kit. Bear these handy pointers in mind to simplify your buying decision and get the right piece of kit for the job fuss-free. 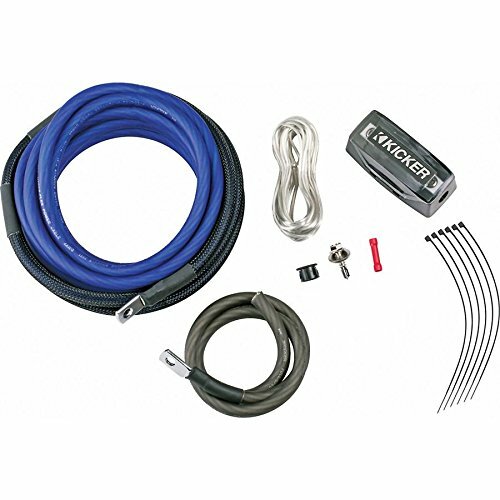 Complete Amplifier Kit: As the name makes clear, everything you need for a straightforward hook-up is included. You’ll get wire (speaker, power and ground), the RCA cables, grommets, fuse holders and terminals along with remote turn-on wire if applicable. 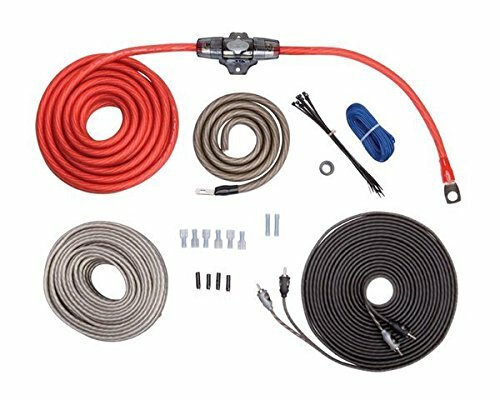 Power Kit: This kit gives you the basics for powering your amp but you won’t get any wire or connection cables. You can also pick and choose from these power kits and buy individual parts if you already have some of what you need in place. The key benefit to a power kit is that you’ll get extra hardware thrown in including wing terminals and cable ties. The next issue you need to consider is the wire sizing. There’s no clear-cut answer here since you’ll need to match the wiring with your amp. Whether you buy your amp first or the installation kit, you’ll need to be absolutely certain they’re a good fit. Note: You might see 10-gauge wire available but this is generally not worth the extra money and can actually be tougher to work with. Much of the wire sold today for speakers and amps is copper-coated aluminum wire. Often, this is not clearly disclosed so you might think you’re buying pure copper. Since the price of copper started rising, this is now the most common method of production but it doesn’t work as well as pure copper for high-current wiring. For the average installation, this won’t be a problem. If you specifically want pure copper wiring, make sure you check the labeling closely. Always err on the side of caution when it comes to the length of the wire. You’re much better placed with a little extra than selling yourself short and not having enough. You’ll need a power cable long enough to reach from the positive terminal of the battery and the fuse holder to your amp. Don’t forget to factor in extra for the little bends and kinks. 18 feet is a decent guideline for power cable. The RCA cables and remote wire should be around 15 feet but it certainly won’t hurt if you get a bit more. Scrimping on the wire leads to stretching and tension which is likely to bring about trouble further down the track. Some of the best amp wiring kits include ring terminals. These help no end with solid connections for both positive and negative cables. If you’ve got a more complex system with more than one amp on board, you should look for a dual-amp wiring kit. Investing in a power distribution block lets you run several amps using just one power wire from your battery. Using multiple outlets, you can then run wiring to your amps. It’s essential to make sure your amp kit’s fuse rating matches or exceeds that of your amp. This will put paid to any nasty power spikes. 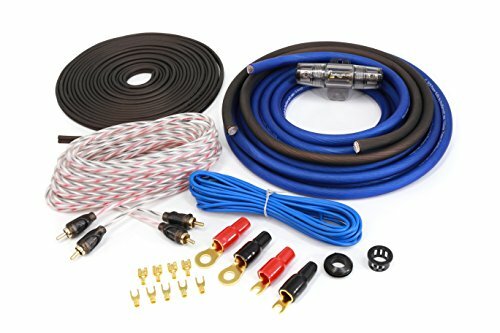 We hope these brief reviews and handy buying guide have helped you along the way to choosing the most appropriate car amp wiring kit. Getting your amp wired up is really not rocket science but it’s worth taking the time in advance to think about what you need. Failing to plan ahead is liable to lead to mistakes that simply don’t need to occur if you do your due diligence. Check out our range of articles on getting the best amplifier for your car if you’re stuck for choice there and come back soon!